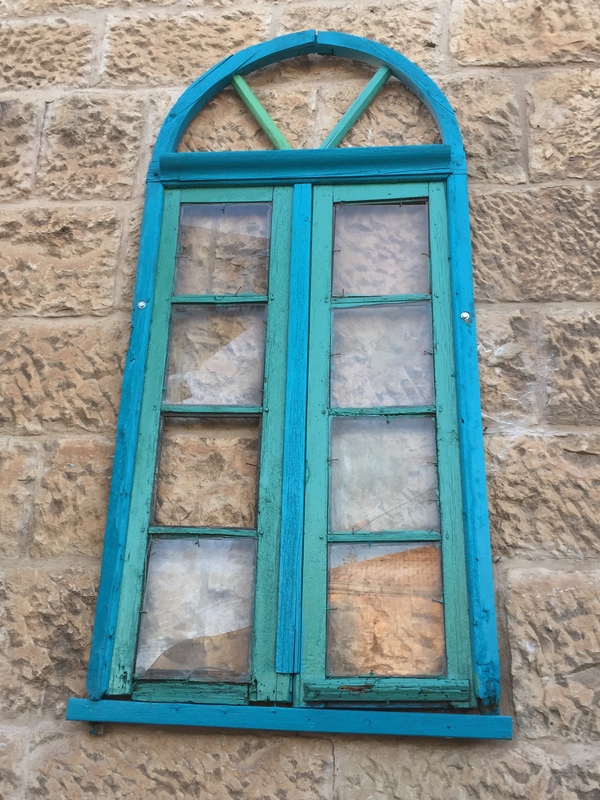 The seeds of new thinking about how Israelis and Palestinians could live together can be found in a surprising place: a dialogue between Jews and Palestinians living in the hills between Bethlehem and Hebron. If you think you understand Zionism, read on for a surprising reframing of the concept. If you think you understand all the possible paths to peace, read on to discover what the “one and a half state” solution might look like. Amos Oz wrote “A tale of Love and Darkness” about his life and family in Jerusalem. In our visit to the West Bank of the Jordan River, we met with Jewish settlers and Palestinian activists who told us their own stories of love and darkness, sadness and joy, history and trauma. Here are two stories of love and darkness that also hold important keys to a possible shared future as recounted by an outsider who is here to listen in hopes of finding some way forward. Rav Hanan Schlesinger lives in Gush Etzion, a group of settlements between Hebron and Bethlehem, for more than 30 years. He describes himself with three words: Jewish, Zionist, Settler. When Rav Hanan says he is Jewish, this means he belongs to the Jewish people.. To Rav Hanan, to be Jewish means to connect with a 3000 year history in this land and share a sense of belonging as members of the Jewish people. Ninety percent of Israelis living in Gush Etzion are religious Jews who connect with the history of Abraham and Sarah, and see themselves as links in a chain. Rav Hanan is also a Zionist. He deeply identifies with the Jewish people’s desire to live on the land of Abraham and Sarah, and of the stories in the Torah. When Romans burned the Jewish Temple in Jerusalem in 70 CE, Jews were sent into a diaspora that had already begun generations earlier when other outside forces attacked the Jewish people. Rav Hanan described how for all those centuries of exile, religious Jews prayed three times a day and on every holiday that someday they would return to the Land of Israel. This existential exile lasted for over 2000 years, with Jews treading water until they could return home. They were always the minority, suffering persecuting and death from those in power. For Zionists, “Never again” was the commitment that Jews would never allow that to happen again to Jews. They would have their own state, their own army, and protect themselves from all the outsiders who threatened them. Next, Rav Hanan explains what he means when he says he is a settler. A settler is a Jew who lives in the West Bank, which he rather calls by the biblical name of Judah and Samaria. He doesn’t want to live in secular Tel Aviv. He wants to live on the actual land between Hebron and Bethlehem. This is the land where ancient mikvahs (Jewish ritual baths) from thousands of years ago still exist. The book of Genesis takes place in Hebron, Bethlehem, Nablus and other places in the West Bank. For him, it doesn’t make sense that Jewish people cannot live in an area that for him and many other Jews, has the most significant historical and religious meaning. Next, Rav Hanan begins to talk about his own transformation. With humility, vulnerability and openness, Rav Hanan describes how he was blind to the Palestinians living all around his community. He has lived in the Gush Etzion block for 33 years before he ever met or talked to a Palestinian. When Rav Hanan had the opportunity to meet a Palestinian in a dialogue, he crossed a field outside his community with a pounding heart. His wife and family thought he might die. His community warned him that Palestinians would kill him. Instead, he had a transformation. He met with a Muslim woman in conservative dress. They both said to each other, “I cannot believe I am talking to you. I never imagined this moment.” Next her Palestinian son came over to talk. His windbreaker had a logo on it. It read “Seeds of Peace.” Seeds of Peace is a peacebuilding organization that brings Palestinian and Jewish youth together to build relationships. Rav Hanan said his world changed at that moment: when he realized he was talking to a person who desired peace. Rav Hanan recognized that for 33 years he had been blind to the Palestinians living around him. It was only through this meeting that he began to see the reality of millions of Palestinians living side by side with Jews in a land that in his newly acquired perspective they both had every right to claim as their own. Then Rav Hanan took another pivotal step. He googled “Israeli occupation of Palestinians.” He came to many websites. Some were filled with antisemitic hatred and purely negative portrayals of Israel, without giving any Jewish perspective. These websites told the story of Palestinian persecution without telling any part of the Jewish story. Jews were talked about as “colonizers” from Europe without any recognition of the immense suffering of Jews in Europe, or the historical or religious sense that Jews had been exiled from this land and wanted to return for centuries. It explained that it was hard for him to continue reading about occupation. He had to muster all his courage and emotional strength to filter out the information about the occupation from the antisemiitic narrative that surrounded it. But he did. And he planned more meetings with Palestinians. And he invited more people to the opportunity for transformation: To see their neighbors as human beings who desire to live with their families in peace and freedom. Today he works to prepare other Jews for these encounters to challenge the ignorance, stereotypes and racism that prevent Jews from seeing Palestinians. “Israel’s legendary Foreign Minister Abba Eban once stood at the podium of the United Nations general assembly with a Bible in his hand, declaring before the whole world that the Jewish people’s title deed to the Land of Israel is over 3,000 years old. Rabbi Menachem Froman of blessed memory disagreed; not only with the proof of ownership but with the very claim of ownership. He believed that the Jewish people do not own the land at all! “The Land of Israel belongs to the People of Israel” has been a longstanding slogan of Religious Zionism, but Rav Menachem, settler leader that he was, never tired of telling all who would listen that the Land of Israel does not belong to the People of Israel. On the contrary, the People of Israel belong to the Land of Israel..
For Rav Hanan, the “one and a half” solution – also known as “two states, one homeland” might be the answer. Rav Hanan describes this as “a modified version of the classic two state solution. The difference is that the borders are soft meaning that Palestinians and Israelis can cross freely. Each side has citizenship in their own state but can live their lives on the other side. There would be a confederation between the two sovereign states.” This option would protect a Jewish state and its need for security while also allowing for recognition of Palestinian rights and freedoms. But Rav Hanan also says this, “Palestinians cannot win their freedom by denying my truth, my history, my religious and historical connection to this land. “ Rav Hanan recalls being invited to attend a Christian conference called “Christ at the Checkpoint” at Bethlehem Bible College. There, he heard Christians say three things: Frist, they want to understand and listen to Jewish people. Second, they say they do not want to be antisemitic. And third, he heard them say that Jesus cancelled old testament theology and God is not involved in geography. In other words, Rav Hanan said that he heard Christians tell him that Jews have no legitimate connection to the land. For Rav Hanan, this is borderline antisemitism. For him, the first two points cannot be true if they attempt to exist alongside the third point. Christianity has a 1700-year-old history of antisemitism. Like racism, many people are simply blind to their internalized hatred. Many times Christians have no idea when they are being antisemitic. But the refusal of progressive Christians to examine their internalized antisemitism and their rejection of Jewish connection to the land does no favors to Palestinians and slows, not hastens, the end of occupation. If Christians want to know how they can end occupation for Palestinians, they are first going to need to have a lot more dialogue with Jews. At the same time, antisemitism is both a reality, and a politically charged excuse. The horrific history of antisemitism means that for many Jewish people, any concerns or criticism of Israeli policies by Christians, Europeans, the UN and Arabs, including Palestinians, can be shut down by simply framing any concerns about Israel’s policies as anti-Semitism rather than any legitimate concern. . Occupation is real and we have seen it here in the West Bank with our own eyes. Rav Hanan gave us one story of love and darkness; love for the land and the dis-ease of recognizing the cost of Jewish settlements on Palestinians. Sami Awad, a Palestinian Christian gives a different narrative. Sami Awad, the founder and director of Holy Land Trust, met us on our first day in Bethlehem. Like most other Palestinians, Sami protests the ongoing destruction of occupation and the destruction of Palestinian homes and villages by Israeli forces from 1948 to the present. Unlike many other Palestinians, Sami had an opportunity to visit Auschwitz. Here, he says he recognized the incomprehensible suffering of Jews and recognized their need to have a secure home. In 1948, God fulfilled his promise to the Jewish people by returning them to the promised land. In 1967, God continued to fulfill his promise to the Jewish people by returning more of the historic homeland of the Jews. As Jews, the covenant is a two-way street. God did his part of the covenant. But the Jewish people have not yet fulfilled their part of the covenant. The Jews are not being a light to all nations. Jews are not treating the stranger with care. Jewish people are violating the covenant in our treatment of Palestinians. Then this rabbi listed off all the ways Jews were hurting Palestinians. The rabbi told Sami that Jews needed to reject European-style colonialism and transform into a new relationship with Palestinians. The rabbi told Sami that Zionism was the vehicle that brought Jews back to their homeland. But that Zionism could not take them into the future. Then the rabbi said this: Israel needs to take down the separation wall and the refugees need to be allowed to return. He said there was no demographic threat. He said a far greater threat to the Jewish people was the loss of faith, the loss of morals and the corruption in Israeli government, with former presidents in prison and the current prime minister under indictment for mass corruption. Sami recounted this story and then there was a long pause. I have always thought of rabbis in the settlement communities of the West Bank as obstacles to peace. But in the space of a week, I learned about two rabbis living in settlements saying things I have never heard anyone say in Washington DC or Tel Aviv. The logic and narrative of this rabbi was not one Sami had heard before either. The Oslo peace process excluded religious leaders. But Sami pointed out that religious leaders may have insights that can break through the impasse. Here was a conservative rabbi arguing for a one-state solution in which Jews and Palestinians live together equitably. For many years, Palestinian leaders have pushed for a two-state solution. The BDS campaign (that stands for Boycott, Divestment, and Sanction) against products and institutions related to Israeli settlements is based on the idea that settlements are an obstacle to a two-state solution. Sami’s organization the Holy Land Trust had advocated for a two-state solution for many years. But many Palestinians, including Sami, conclude that there simply is not a piece of land left for a Palestinian state. The Israeli government, aided by Christian Zionists, has funded and supported new Jewish settlements all over the West Bank. The Holy Land Trust organized tours for us to see these settlements and the West Bank Areas A, B, and C.
The Palestinian Authority and Israeli government have different areas of control in each of these areas. Area A is under control of the Palestinian Authority. But Area A is not contiguous. It is a patchwork of tiny plots of land. It is not comprehensible how a state could be formed in Area A. Both Jews and Palestinians acknowledge that Israel is treating Area C as part of the state of Israel. This is the largest part of the West Bank. The Israeli government does not allow Palestinians to repair their homes or build structures here. The Israeli Defense Forces come with bulldozers to demolish any structure without a permit. And then the Israeli government sends a bill to Palestinians to pay for the demolition. For Sami and the Holy Land Trust, a dialogue between Jewish settlers and Palestinians is necessary in order to explore other options for securing Palestinian rights. But Sami does not put all of his hope in dialogue. And he understands first hand the frustrations and potential for dialogue to take a lot of patience and energy. But Sami also does not put all his bets on BDS either. For many Palestinians, BDS is the only hope and they have abandoned nonviolent protest and dialogue or any other effort toward change. For Sami, Palestinians should use direct nonviolent resistance, BDS and dialogue. This is the approach we advocate at EMU on any conflict. It is called strategic peacebuilding. It does not rely solely on punishment-based sanctions, like BDS. Rather it sees the need for many different paths and efforts. On the one hand, pushing for justice through coercive-based methods like boycotts and on the other hand, recognizing the humanity of the other and investing in efforts to persuasion through change of attitudes, beliefs and behaviors. But this is not popular idea among some Palestinians. Some Palestinians view Sami and other Palestinians who engage in dialogue as traitors. Sami notes that some Palestinians boycott Holy Land Trust because they are engaging in dialogue with Israelis. On the other side, other groups are boycotting Holy Land Trust because they are seen as too radical, calling for an end of occupation. This is the impossible life of working for a just peace, where people on either side call you a traitor. Sami’s dialogue with Israelis and settlers uncovers many new possibilities and paths. Sami’s dialogue illustrates new ways of understanding how the concept of Zionism might change. For many Palestinians, Zionism by definition means they have no right to exist or live in this region. For many Palestinians, Zionism cannot coexist with democracy. It is unlikely that millions of Jews are going to abandon Zionism. But they might transform their understanding of what Zionism means. A Zionism that emphasizes Jewish connection to the land, but challenges the Jewish morality of occupation is necessary to ending the occupation. A Zionism where Jews belong to the land, while making space for the idea that Palestinians also belong to the land is necessary. Sami also emphasized the need for trauma healing on all sides. Sami points to his experience at a memorial for the holocaust in Europe as an important step in understanding Jews. And for Sami that experience led to a question: How can a victimized people victimize someone else? Why must Palestinians pay the cost for Jewish suffering? The legitimacy of someone’s suffering does not create permission to make another group suffer. Sami is not the first Palestinian to call for wider recognition of the conditions Jews fled before they arrived in Jaffa port. Palestinian Archbishop Elias Chacour carried with him the Diary of Ann Frank and would tell other Palestinians what Jewish people had experienced and why it was important for Palestinians to reach out in love to Jewish people in his book best selling book Blood Brothers. For Sami, like all the other Palestinians we have met, it is also incomprehensible why Jews escaping persecution could move into the homes and villages of the people living there before them without caring about the trauma they caused to the Arabs living in those homes. 530 Palestinian villages were destroyed or depopulated. 700,000 Palestinians lost their homes. Today 7 million of 12 million Palestinians are refugees or displaced. Refugee camps for these Palestinians are still scattered throughout the region. “Spiritual nausea” is truly an affliction. I know because I also suffer from spiritual nausea. We have to find room in our hearts for two truths, two peoples who both love the land they live on. In an earlier blog, I shared that US diplomat Dennis Ross said these very same words at Kibbutz Ketura in September. Progressive Christians who come to Bethlehem and learn about occupation without studying the history of Christian antisemitism and without listening to and engaging with Jewish people are in the dark. They hold partial truths. I believe they do more harm than good. And I count many of the Mennonite colleagues I have heard speak of Palestine in this group that is righteous about their partial truth. I also count in this group the people in my life who won’t speak to me or support my son’s bar mitzvah because my husband and I talk to Palestinians and because we think the occupation is real and terrible. It is much easier to point fingers and hold partial truths. It is easier to blame others without listening to their story, their narrative. Some Palestinians and Jews call people like Sami Awad and Rav Hanan Schlesinger as naïve, as dreamers, as traitors. But isn’t it naïve to think that all the Palestinians are just going to disappear? Or that Israel is going to disappear? It makes no sense. Those who are not spiritually nauseated are the ones who are dreaming. The reality is this: something has to change. The only possible positive future for Jews and Palestinians is one in which they live side by side in peace. The occupation and unequal treatment of Palestinians has to end for that to happen. And the denial of Jewish peoplehood and connection to the land also has to end for that to happen. Palestinians need new leadership. Israelis need new leadership. The Roots Dialogue between Israelis and Palestinians is a necessary part of this social change. It uncovers new religious insights and theological possibilities for understanding the situation here. It creates greater awareness of the positions, interests and experiences of different Israelis and Palestinians. It begins to build channels for communication and relationship that are necessary, particularly in times of crisis. It heightens awareness of the unintended or subconscious antisemitic language embedded in some of the efforts toward Palestinian liberation. And it creates a resource scarcer than water or land in this region: trust. So. Welcome to spiritual nausea. If you don’t have it, you might not be listening. And it is unlikely there can be any healing in this conflict without first experiencing spiritual nausea. We have to get sick in order to get well. The author, Lisa Schirch, is in Israel and Palestine for 3 months leading a study abroad program with her husband Bill Goldberg for students from Eastern Mennonite University. This article is part of a blog series on their trip. Thank you so much for keeping us informed of your experience and reflection in Israel/Palestine. What a life changing experience your family is having. It is hard to imagine the grief and trauma of so many folks there—and around the world. We will be eager to welcome you all home again. Very interesting. Thanks for sharing these perspectives. beautifully written. I love the falsehood quote. I would love to hear you write more about where the current policy of “anti-normalization” is at..and what whether that is evolving…..